My Mocha Money - Make AND Save Money or DIY Trying! Make AND Save Money or DIY Trying! Sell Used Books on Amazon For Money-Great Home Business! Make Money Selling Your Hand Painted Items On eBay-Even If You Can’t Paint! How To Start an Internet Business the Right Way: Free E-Books! Small Face Painting Designs On Kids–Great Home Business! Last Minute Gift Ideas for Anyone on Your List: This One Strategy Works Every Time! 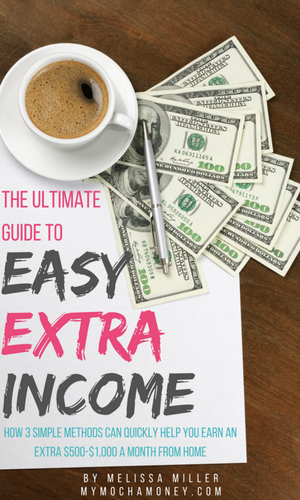 Sign up to download your free copy of The Ultimate Guide to Easy Extra Income, my 34-page eBook, that will explain my 3 simple methods to help you quickly earn an extra $500-$1,000 a month from home. These are the same methods I used. You can get started earning money right away! What To Sell on Ebay? Easy to Find Items That Put Cash in Your Pocket! Visit Melissa Miller's profile on Pinterest. What to Sell on eBay? Here are the Answers! MyMochaMoney.com Copyright © 2019. We are a participant in the Amazon Services LLC Associates Program, an affiliate advertising program designed to provide a means for us to earn fees by linking to Amazon.com and affiliate sites.